David Epstein is a senior writer with Sports Illustrated, where he focusses on sports science and medicine. 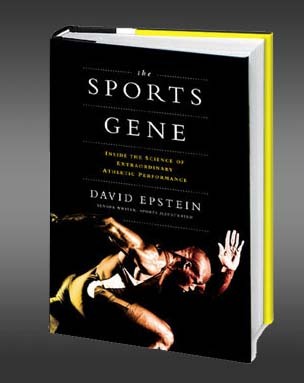 His book The Sports Gene is a fascinating ramble through the ongoing debate over genetics versus personal will and training; the Nature versus Nurture argument. I say a 'ramble' because it does not take one side of the debate and build a case for it so much as looking at the state of research in a variety of fields that tackle this topic. Each chapter takes an example of a high achieving individual or particular group of individuals and explores the question of how they got to be so good. He looks at Malcolm Gladwell's 10,000 Hours hypothesis (to get good at anything takes 10,000 hours of practice), the dominance of Ethiopian and Kenyan runners at longer distances, the supposed innate faster reaction times of a pro baseball hitter, and the alleged built-in advantage of endurance athletes that come from high altitudes. He also investigates the somewhat disturbing world of genetic testing for sporting ability - does it work and, as importantly, should we be doing it? The research he describes is fascinating and, for the most part, does not come down on one side of the debate or the other. The conclusion appears to be that it is Nature and Nurture - some genetically gifted individuals will be couch potatoes, and some athletes who without these so-called 'gifts' will still become among the best in their sport.